Easily grown in moist to wet soils in full sun to part shade. Thrives in moist soils much better than most other species of Coreopsis. Tolerant of heat and humidity. This is a stoloniferous plant that may form dense colonies in optimum growing conditions, but is not considered to be invasive. Propagate by seed or division. Although its native habitat is located within USDA Zone 8, this plant is reportedly winter hardy to USDA Zone 5. Coreopsis integrifolia, commonly called Chipola River tickseed, is a yellow-flowered herbaceous perennial in the aster family which typically grows in a slowly spreading clump rising to 18-24” tall. This is a rare species which is native to low woodlands, floodplains and stream/river banks primarily in the area of the Chipola River in the Florida panhandle but also in a few other scattered coastal plain populations in far northeastern Florida, southern Georgia and southeastern South Carolina. Single flowers (2" diameter) bloom from September to late October atop upright stems rising above the foliage clump to as much as 30” tall. Stems are clad with waxy, unlobed, opposite, elliptic to lanceolate, deep green leaves (to 2” long). Each flower typically features 8 deep yellow rays (3 deeply cut lobes at the apex of each ray) surrounding a dark purplish-black center disk with two sets of bracts underneath. Flowers give way to 1/ 4” long flattened seeds with two bristles on the tip. Coreopsis integrifolia is listed as both critically imperiled (G1 and S1) and imperiled (G2 and S2) on both Federal and State of Florida lists. It is listed as endangered by the Florida Department of Agriculture. 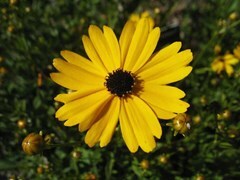 Flowers of the genus Coreopsis (16 species native to Florida) were designated in 1991 as the Florida State Wildflower. Specific epithet comes from the Latin words integer meaning entire and folium meaning leaf in reference to the undivided plant leaves. Common name of Chipola River tickseed is in reference to the native habitat and the flower seed resemblance to ticks. No serious insect or disease problems. Compact plants are less likely to sprawl than taller varieties of coreopsis. Potential disease problems include leaf spot, rust and botrytis. Watch for aphids, four-lined plant bug and the cucumber beetle. Mass in moist open woodland gardens. Also effective in naturalized areas, stream/pond peripheries, meadows or cottage gardens. Native plant gardens. Notwithstanding the stable but imperiled status of this plant, it is available for purchase at this time through some nurseries.